A spunky, modern take on A Christmas Carol. A huge perk of having a wealthy, movie-director father who lives in Malibu, California, and a fashionable yet recently deceased stepmother? Raiding your stepmother’s closet, of course. 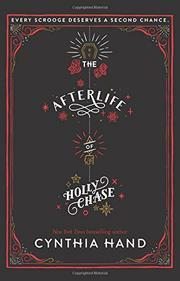 And after Holly Chase goes on a power trip on the family maid on Christmas Eve, it’s no surprise that she’s visited by Christmas ghosts, all warning her of her selfish ways. Unlike Ebenezer, who heeded the ghosts, the white 16-year-old promptly dies but awakens in New York City, where she becomes part of Project Scrooge, serving as the Ghost of Christmas Past. The story then fast-forwards five years as the diverse Project Scrooge team is preparing for Scrooge 173. Hand’s detailed descriptions of their secret processes, from surveillance to time-traveling tunnels, are amusing and clever. But Holly is still self-absorbed and lonely until Stephanie (who’s alive and can fetch coffee!) arrives to assist her. When Holly discovers that the next Scrooge is Ethan Jonathan Winters III, WASP-y heir to one of the biggest real estate dynasties in New York (and hot! ), Holly takes an interest in her job and her past for the first time. Both enjoyment and soul-searching ensue as the teen develops friendship and a covert romance. While it’s clear where the story is headed, Hand leaves several avenues open to keep readers guessing until the very end.